City attorney Pete Holmes is prosecuting demonstrators who closed off downtown streets earlier this year by employing new techniques that make it harder for police to disperse them. Seattle is taking a harsher stance against protesters who block traffic, after several demonstrations involving dozens of people closed off downtown streets earlier this year. The protest that took place in May was aimed at Chase Bank for its investment in tar-sands development and the Trans Mountain Pipeline. Demonstrators, who were arrested after blocking traffic for five hours by sitting on wooden tipis that they built in the middle of the road, were charged in Seattle Municipal Court with pedestrian interference and obstruction, which represent a misdemeanor and a gross misdemeanor, respectively. A guide to protester rights published by the civil-rights organization, however, advises that demonstrators may be criminally charged if traffic is intentionally blocked as an act of civil disobedience. Dan Nolte, a spokesperson for the City Attorney’s Office said the charging decisions arose out of the relatively new strategies employed by protesters to block roads as a way to call attention to their causes. 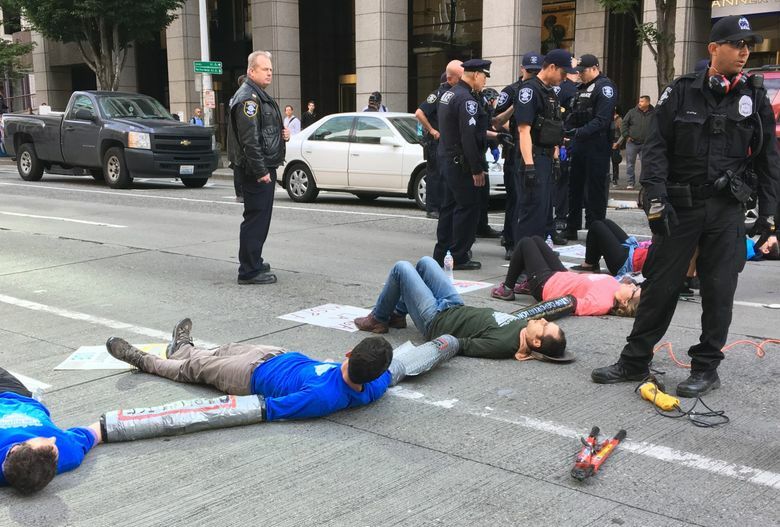 “The use of extended street blockages is a fairly new type of protest in Seattle, so we typically haven’t had the option to consider filing charges,” Nolte said. Previously, he said, it was more common to see people charged with trespassing for demonstrating on private property. In March, downtown streets were closed and traffic was backed up for hours when opponents to the new King County juvenile-detention center also used the technique. The Seattle Police Department did not at arrest those protesters and later explained that decision as an effort to observe demonstrators’ right to free speech. “Civil disobedience is a time-honored American tradition, but part of civil disobedience is the sacrifice made when you have to face the consequences,” Holmes said. “The fact that these protests are a First Amendment exercise is not a get-out-of-jail free card,” he said. If convicted of pedestrian interference, protesters face up to 90 days in jail and a $1,000 fine. For a conviction of obstruction, protesters face up to a year in jail and a $5,000 fine. Holmes’ office said it will not seek the maximum penalties. The protesters are to be arraigned in Seattle Municipal Court on Sept. 12.